2013 map by 'journalist' Robin Wright. Thierry Meyssan, at voltairenet.org, writes that on the subject of SYRIA and its neighbours, the US-led coalition is divided. 1. 'Israel' is right next door to Syria. Israel does not want total chaos in what remains of Syria. 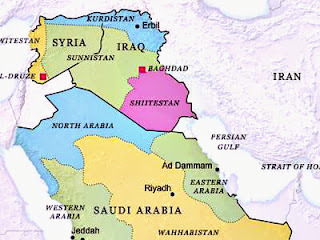 So Israel and the USA are prepared to consider letting Syria survive, but as a much smaller state (Shiitestan). 2. The USA wants a Kurdistan. 3. Turkey does not want a Kurdistan and it wants the destruction of the Assad regime. He's Back! Abu Bakr al Baghdadi- We didn't even have time to miss ya!